New Hampshire Officials start rulemaking on Medical Cannabis Law. ACTION ALERT: Win a Trip to DC for ASA’s Conference! In the wake of the Department of Justice saying it is changing policy on marijuana enforcement and mandatory minimum sentencing, the Senate Judiciary Committee held two hearings to get more answers. On Sept. 10, less than two weeks after the DOJ issued a memorandum telling federal prosecutors to change how they enforce marijuana laws in states that have legalized its use, the Judiciary Committee brought the memo’s author in to answer questions. Deputy Attorney General James Cole, the second ranking official in the DOJ, faced questions about how state-licensed businesses such as medical cannabis dispensaries can safely conduct financial transactions when the federal government continues to classify any banking they do as illegal money laundering. Cole said the DOJ recognizes it is a problem they “need to deal with” and are working with federal banking regulators on a solution. Medical cannabis dispensaries have been systematically denied access to banks and other financial services by threats from federal prosecutors. Shortly before the latest memo was released, the DEA also said armored car companies cannot service licensed medical cannabis businesses. On Sept. 25, the Judiciary Committee held another hearing on mandatory minimum sentencing, which disproportionately affects people convicted of drug crimes and is commonly used as leverage by federal prosecutors to obtain guilty pleas in medical cannabis cases. Attorney General Eric Holder has instructed prosecutors to remove reference to drug quantities that trigger mandatory sentencing, but the laws remain in effect. 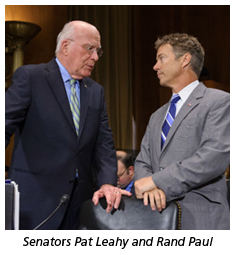 The Senate hearing was in support of a bipartisan bill sponsored by committee Chairman Sen. Patrick Leahy (D-VT) and fellow committee member Sen. Rand Paul (R-KY), the Justice Safety Valve Act (SB 619), that would give judges more discretion in sentencing. Many medical cannabis providers are currently serving 10- or 20-year federal sentences due to mandatory minimum sentences related to the number of plants they cultivated for patients. Following the first Senate hearing, ASA hosted an online forum with federal medical cannabis defendants, family members of those the DOJ has incarcerated in the war on medical cannabis, and local officials fighting federal interference with safe access. Medical cannabis patients and advocates in Washington State have a chance to weigh in on new regulations for the state’s program in light of the voter initiative on adult use. Washington state lawmakers have directed the Liquor Control Board to work with the Department of Health and the Department of Revenue to create recommendations for the legislature on how the state’s medical cannabis program will interact with the new, adult-use system approved by voters last fall. The three departments have created a workgroup of senior staff from each agency that has been meeting since July. They are scheduled to release draft recommendations Oct. 21. After considering community input, the group will present recommendations to House and Senate committees at the Legislative Assembly Days, Nov. 21 and 22. Final recommendations go to the Legislature on Jan. 1. State residents have until Nov. 8 to email suggestions to medicalmarijuana@liq.wa.gov. The Massachusetts Department of Public Health late last month approved 158 out of the 181 applications it received for medical cannabis dispensaries as meeting the state’s standards. The 158 who were approved now advance to Phase II, in which a committee will score each applicant on several criteria, including the proposed facility’s ability to meet the needs of patients, degree of community support and the appropriateness of its location. Final approval is slated to go to 35 applicants in locations distributed around the state. State law mandates between one and five dispensaries in each of the state’s 14 counties. The process is expected to be complete by the end of the year. Since voters passed a medical cannabis initiative last November, more than 100 municipalities have taken some zoning action on where dispensaries will be allowed to operate. The state attorney general’s office has said towns cannot adopt zoning that prevents dispensaries from operating because that would thwart the purpose of the state law. New Hampshire held the first meeting of the state’s advisory committee on medical cannabis last month to begin rule making for the new program. Gov. Maggie Hassan signed HB 573, a bipartisan bill, July 23, but officials say patients may not be able to register with the program until next summer. The law gives the state Department of Health and Human Services a year to set rules for issuing registry ID cards to patients, and until January 23, 2015 to establish regulations for the four medical cannabis dispensaries slated to provide medicine in New Hampshire. Until the state issues registry cards, qualifying patients do not have protection from arrest and prosecution, and until dispensaries are operating, patients will have no legal means of accessing their medicine. The new Therapeutic Use of Cannabis Advisory Council will propose regulations to the state legislature and help oversee the program. The committee is comprised of 15 individuals appointed by the governor and includes one the bill’s House sponsors and the head of the New Hampshire Civil Liberties Union. The state’s Joint Legislative Committee on Administrative Rules will have final say on how the program is run. Illinois state officials last month set in motion the process for regulating the medical cannabis program signed into law by Gov. Pat Quinn this summer. Officials from several state agencies began meeting to review the programs established by other states and to divide responsibility for drafting rules that are slated to be presented to state lawmakers in May 2014. The Illinois Department of Public Health will be responsible for verifying physician recommendations and issuing ID cards. The Department of Financial and Professional Regulation will regulate the 60 dispensaries that will be responsible for distributing medical cannabis to patients. The Department of Agriculture will license one cultivation facility in each of 22 State Police districts. Each agency will submit draft rules, with final versions expected to go before a panel of state lawmakers in late spring. The law goes into effect Jan 1, 2014, but the program may not be up and running until summer. Bill sponsor Rep. Lou Lang has said he hopes it will be able to begin helping patients sooner. A week after the Justice Department issued a memorandum saying federal prosecutors should respect state regulation of cannabis, California legislators introduced a last-minute bill that would have established statewide rules for medical cannabis businesses. But with only days to go in the session, the Medical Cannabis Regulation and Control Act (AB 604) faced an uphill battle. AB604 would have created a new division within the Department of Alcoholic Beverage Control (ABC) to develop, implement, and enforce regulations for commercial medical cannabis activity throughout the state, including production, processing, distribution, transportation, and testing. The bill would have grandfathered in medical cannabis businesses already operating legally under city or county laws, and the activities of patients and their caregivers would have been unaffected. The bill—introduced by Assembly Member Tom Ammiano and co-authored by Sen. Darrell Steinberg and Sen. Mark Leno—was spurred by the DOJâ€ˆmemo saying federal prosecutors would defer to local and state law enforcement in states with strong regulations. "It's long past time for state legislators to roll up their sleeves and finish the job of implementing California's medical cannabis law, so we look forward to seeing a similar bill in the next session," said Don Duncan, ASA California Director. "Patients in California have been losing safe access across the state because of attacks from US Attorneys." AB604 was opposed by the California Narcotics Officers’ Association and other law-enforcement organizations. Michigan’s medical cannabis law specifies that patient or caregiver status is not to be used as grounds for loss of any parental rights, but that didn’t stop Child Protective Services from taking a 6-month-old girl from her parents. CPS took custody of Brielle “Bree” Green after deciding that the medical cannabis plants being cultivated in a locked room posed a threat of armed robbery that endangered the children. Bree’s mother, Maria Green, is a registered caregiver for the child’s father, Gordon “Steve” Green, a registered patient who uses cannabis to control his epilepsy. CPS visited the Green’s home after Maria Green’s ex-husband filed a complaint. The child’s removal was upheld by Ingham County Family Court Referee Rod Porter, and then again by Family Court Judge Richard J. Garcia. Bree is now in the custody of her mater-nal grandmother, 140 miles from her parents. Americans for Safe Access has just launched a revamped website that makes it easier to find critical information about medical cannabis. The new design makes it even easier to learn about the science supporting medical cannabis, the details of state and federal laws, and how to get involved. The new site also uses cutting-edge organizing technology by Nationbuilder to be more effective with ASA’s advocacy efforts. This new platform will also allow ASA to provide better membership services, including a member-only area of the website (coming soon), membership cards, and a custom profile for online advocacy. The new site has the same easy-to-remember URL: AmericansforSafeAccess.org. During ASA’s Fall Membership Drive, anyone who joins, renews or extends a membership will be entered to win a trip to Washington D.C. for ASA’s National Medical Unity Conference in April. The membership prize includes airfare, accommodations and registration for this important conference.